At this year’s INBOUND and FutureM conference in Boston, Ekaterina Walter of Sprinklr delivered a real-time marketing talk that was one of the more buzzed about presentations. And for good reason – marketers understand the value of real-time marketing, yet many are still trying to set themselves up for success. 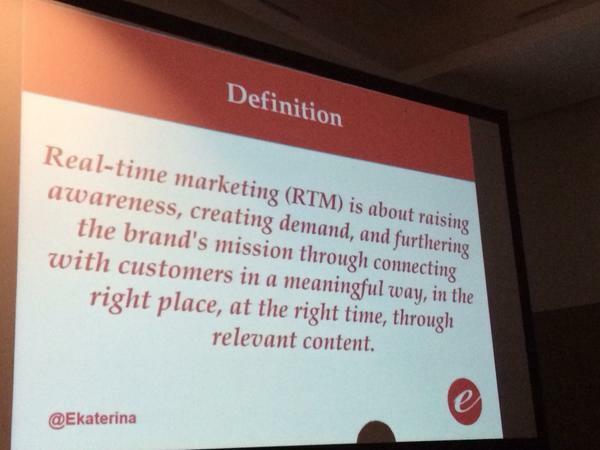 As marketers look to launch or fine-tune their approach to real-time marketing, here are five tips and takeaways from Ekaterina’s presentation to propel your efforts. 1) Define what real-time marketing means to your organization. What are those optimal moments for your organization? Start to map out these scenarios and define the value real-time marketing can add to your company. 2) Set yourself up for success by fostering the environment of urgency internally. The most effective real-time marketers set themselves up for success by building an internal team to support both the strategy and execution of real-time marketing efforts. 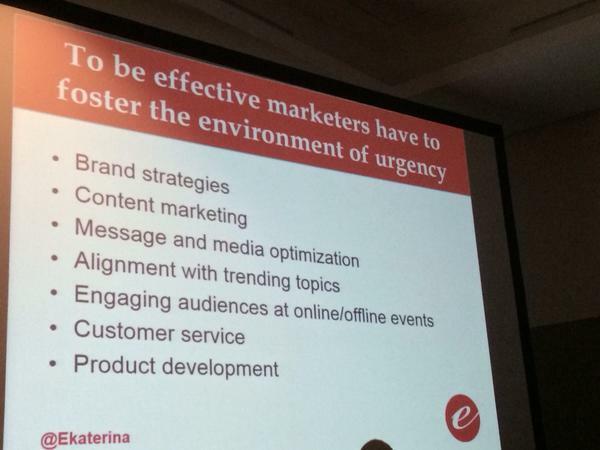 As Ekaterina noted, fostering a culture and environment that welcomes a sense of urgency is critical. This is easier said than done, but real-time marketing requires a different mindset and way of operating. Below are seven examples of marketing components and departments that play a role in activating time-sensitive real-time marketing efforts. 3) Shrinking attention spans require companies to be present and in the moment. Sad but true: The average adult attention span is now between 2.8 – 8 seconds. This is less than a goldfish, which boasts an average 9 second attention span! Real-time marketing offers a powerful solution for captivating consumer attention in the moment. The best tip? Ekaterina suggests being present and in the moment. Relevancy has a deadline, so the best real-time creative and responses comes from practicing engaged listening and seeking out natural openings in the conversation that add value. A great example of this comes from EA Sports. Following a spike in social media conversation about a glitch in the Tiger Woods PGA TOUR 09 game that made it appear like Tiger could walk on water, the team from EA Sports produced this video with a humorous response. 4) Real-time activations must be consumer centric & aligned with brand values. During her presentation, Ekaterina explained how companies are using real-time marketing to cater to their consumers while showcasing their human side. Real-time marketing offers a strong opportunity to celebrate consumers and thank them for their loyalty in the moment. The key: Interactions must be welcomed, thoughtful and aligned with brand values. Otherwise, you run the risk of alienating your consumer base. One company that does this well is Benefit Cosmetics. The company’s mantra is, “Laughter is the best cosmetic, so grin and wear it!” The company pulls this sentiment through into a real-time social media activation by sending consumers who use the #BeautyBoost a customized virtual pick-me-up. The visuals are fun, humorous, and highly shareable. They aim to make consumers smile while fostering a deeper connection to the company. 5) Integrate real-time marketing efforts with existing campaigns, triggering emotions that relate back to your company’s larger mission. Another prime opportunity to leverage real-time marketing comes from activating around existing campaigns, sponsorships, or timely events. With this also comes the temptation to have a “Dunk in the Dark” moment for your company. Should your company go there? As Ekaterina noted, proceed with caution, plus a good amount of planning and strategy. These activations are the strongest when there’s alignment with your brand voice, values and relevancy for your company to join the conversation. For major events like the Olympics and World Cup, it’s also critical to understand the legality and restrictions around brands that are not sponsors. An example of this comes from Dunkin’ Donuts. The company amplified an existing relationship with ESPN to create the first-ever billboard ad made from Vine in a professional broadcast. To take this to the next level, the company also re-created a marquee play from the first half of each Monday Night Football the game on Vine with Dunkin’ Donuts coffee cups as a fun way for the company to join the Monday Night Football conversation while adding value to the TV viewing experience. Hungry for more? Ekaterina Walter has content from her real-time marketing presentation and other top trends that marketers can’t ignore in the Slideshare presentation below.